While cloud storage faces growing demand from businesses and clients, it also requires new methods for data protection and retrievability. Data storage is one of the most popular applications of cloud computing. While cloud storage faces growing demand from businesses and clients, it also requires new methods for data protection and retrievability. The majority of the current methods used for ensuring remote data retrievability are designed for static data, and the few that respond to updates are both costly and require a high level of bandwith. Professors Elaine Shi and Charalampos Papamanthou and the late Ph.D. candidate in Computer Science at UC Berkeley Emil Stefanov have developed a dynamic proof of reliability scheme that requires 300 times less bandwith and that efficiently records updates on data without relinquishing the guarantee that a client’s data is authentic. Their dynamic proof of data retrievability can be immediately deployed to cloud storage services and provides an efficient system for ensuring clients’ data remains their own stored material through any number of updates. 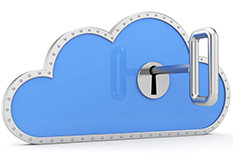 It thus allows cloud data storage services to expand into industries requiring much higher security. I am very excited and honored that the University acknowledges our collaborative effort at the Maryland Cybersecurity Center and UC Berkeley towards building a more secure and usable cloud computing infrastructure.